And the morel is...in the running for the best food I have ever tasted. Morel mushrooms grew in the woods around the farm where I grew up. We cooked them in butter and ate them - and for years I didn't know anyone else who did. As it turns out, morels are coveted, hunted, gathered, and cherished around the world. I don't speak the language, but the picture from a Dutch morel site says it all. In the USA, morels appear first each year on the West coast, as early as January, and delight residents of most of the mid-continental states by late April. Read about the many types of US morels in the Morel Data Collection Project. One homey site offers lots of links to other morel sites that range from scholarly to slightly crazed. Be particularly amazed at the amateur photo gallery of "bragging pictures." Like this one. About morel recipes: There are not many good ones, for good reason. Morel mushrooms taste best when cleaned and pan fried in the best butter you can find. Embroider on that by dusting them with cornmeal or dip in a beaten egg and roll in finely crushed saltine cracker crumbs. Change the fat to either lard or bacon grease. But don't go farther than that - just eat these incredible natural gifts in the ways that make their taste most intense and clear. You will never have enough of them to use in experimental recipes anyway, so stay with what works. 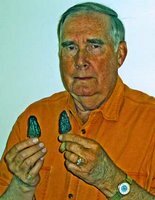 On April 5, 2006, I interviewed morel hunter extraordinaire and Wayne County Kentucky) native Dallas Jones, now living in Monticello, Kentucky. Dallas gave me a great deal of useful information for my column in the May, 2006 issue of Nougat.